The CH-53K King Stallion successfully completed an external lift of a 27,000 pound payload at Sikorsky’s Development Flight Test Center in West Palm Beach, Fla. June 17, 2016. 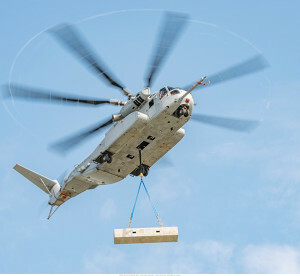 The CH-53K King Stallion successfully completed an external lift of a 27,000 pound payload at Sikorsky’s Development Flight Test Center in West Palm Beach, Fla., June 17. 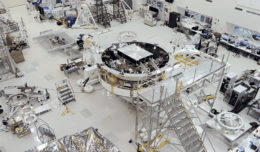 The aircraft executed an “out of ground effect” external load test at 100 feet above the ground while performing hover maneuvers to demonstrate its excellent control authority in this flight regime. An OGE load is the most stressful of lift conditions for a helicopter from a power-required standpoint. OGE is defined as an altitude greater than the helicopter’s main rotor diameter (79 feet, in the King Stallion’s case) where power demand greatly increases due to loss of the benefit of ground effect. A Milestone C decision is part of the acquisition process that provides approval to enter production phase. The CH-53K has already achieved speeds exceeding 140 knots, and a third CH-53K King Stallion helicopter has joined the flight test program thereby accelerating the pace to full aircraft maturity and production. The first two aircraft have already verified the King Stallion’s capabilities well in excess of the predecessor CH-53E. A fourth King Stallion is currently in final preparation for flight status and on track to join the flight test program this summer.